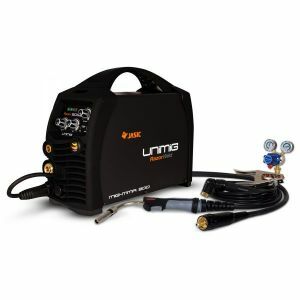 The Razorweld Series MIG205-SS is a new inverter-based portable MIG/MMA/TIG Welding machine with Synergic Programs for 0.8mm and 0.9mm solid welding wires. This is an industrial quality machine that is extremely lightweight and portable. Being 240v single phase gives great versatility. Ideal for general engineers, maintenance workshop, rural workshop, panel beaters and home workshop. The MIG function allows you to weld with both Gas Shielded and Gasless wire applications giving excellent, professional welding results. Easy step-less adjustment of voltage and wire feed coupled with integrated digital meters allows easy setting of welding parameters. The MIG 205SS features Smart set welding with four Synergic Mild Steel welding programs designed for ease of use with your selected gas mixture. The operator selects the gas mixture and wire diameter they are using then simply start welding. Once this is done the operator can make fine adjustments to the voltage for even greater control of the weld pool. The added Lift-Arc DC TIG capability delivers perfect arc ignition every time and a remarkably smooth stable arc produces high quality TIG welds. TIG functionality includes adjustable Down Slope & Post Gas as well as being gas solenoid-valve equipped. The stick welding (MMA) capability delivers easy electrode welding with high quality results, including cast Iron, stainless and low hydrogen. An additional feature is the Spool gun ready function that allows the simple connection of the PLSP240Amp Spool Gun for the use of thin or softer wires that don’t have the column strength to feed through standard MIG torches, such as aluminum wire.